While shopping for my maid-of-honor dress this spring for Twinster’s wedding in October, I very quickly narrowed it down to two choices, but took a long time to make a decision. T and I talked about it a lot, because unfortunately, the reason we loved one dress more than the other was the exact reason we knew I couldn’t get it. See, I think I have just about the coolest mother in the world. She taught me how to be kind, and tough, and has supported me through absolutely everything. But she just can’t stand my tattoos. She loves to admonish me for them whenever they’re visible (*which truly, isn’t that often), tell me how much I’m going to regret them when I’m older, your typical parent things. The dress T and I loved was backless with a sheer cape, and while it was probably the perfect dress for me, it would have put the rib tattoo on display. Now, T wouldn’t have cared less if I showed up sporting a Mike Tyson (“Have you seen my dress? It’s not like anyone will be looking at you”), but Mama B would never forgive me if I wore something that displayed that much of my ink. So I went with my second choice, a dress that’s equally beautiful and has a closed back, and though it doesn’t showcase one of my favorite features, I can’t wait to wear it all the same. I don’t mind that my mother hates my tattoos. Well, let me rephrase that. At this point in my life, and sporting the pieces that I do, I no longer mind that my mother hates my tattoos. I think because the first two were such carefully planned impulse decisions, I didn’t have the chance to prepare for her reaction. In some vague way, I knew she was going to be PISSED (*and she was), but at the same time, I knew that it didn’t really matter how angry she was with me for them, because I’m the one that has to look at them and live with them, and I love them a little more every day. I finally gave her a heads up before getting the third, and planned a careful speech to have with her so that she would understand both my decision to get one, as well as how well-researched and serious I was. She cut me off after a few sentences when I finally worked up the nerve to talk to her, but I didn’t push it. I know she’ll never understand or like them, and so I’ve just continued to get them, warning her along the way if I can, preparing for the renewed anger that I’m getting used to. It’s hard to respond to people when they say things like “I couldn’t get a tattoo, I change my mind too often! !” because I think it misses the point of tattoos. Yes, they’re permanent – but that doesn’t mean it absolutely has to have some sort of higher meaning that will never change, a design you’ll feel exactly the same about from the day you get it till your last breath. I mean, the tiny heart on my ankle was the epitome of an impulse decision. Exactly seven years ago today, I was 19, living in a foreign country, and though I tried telling myself that it was too cliche to come home from six months abroad with a tattoo, I still walked into a shop that cool August morning by myself, an indecisive teenager ready to make a permanent decision. The final product isn’t the design I wanted, it’s not even the design the artist wanted, and I’ve had to have it redone once already. But here I am, seven years later, and despite everything being wrong from what I’d initially wanted, every time I look at my very first tattoo, it reminds me of a time in my life where I was bold. It calls a memory of that wild child in Buenos Aires, who did so many stupid things and a learned a lot of lessons to boot. The tiny heart on my ankle is like my little souvenir from who I was, and what I learned, exactly seven years ago today. The designs have improved with time, and for the last two pieces I’ve stayed with the same artist, because he’s really the one person I trust to put ink to my skin now, but that feeling of a souvenir from a previous LB is true with every one of them. Of the remaining four, one of them makes me feel daring; one makes me feel obvious and loud in the best way; another reminds me that you can choose your family too; and another tells me every day to be grateful. That’s not the order in which I got them, because how each of those memories connects with which tattoo is too personal, even to mention here. But those are pieces of a previous me that I want to remember, and parts of my spirit that I never want to lose. Truly, it’s not for everyone, a permanent reminder of who you were seven, five years, even just one year ago. But whether tattoos “are” for anyone else is irrelevant to my decision to have them, because they absolutely are for me. At the wedding this fall, I’ll wear my beautiful dress with a full back, and stand behind my sister, making sure her beautiful dress looks picture-perfect while she says yes to the rest of her life. And only my arm will be showing, but luckily it’s just the one line, so for Mama B’s fear about the photos, there’s always Photoshop. We’ll have our bridal lunch, and wedding, and then of course the Jets v. Pats game on Sunday, where husband and wife will enjoy a fierce rivalry as such for the first of many times. 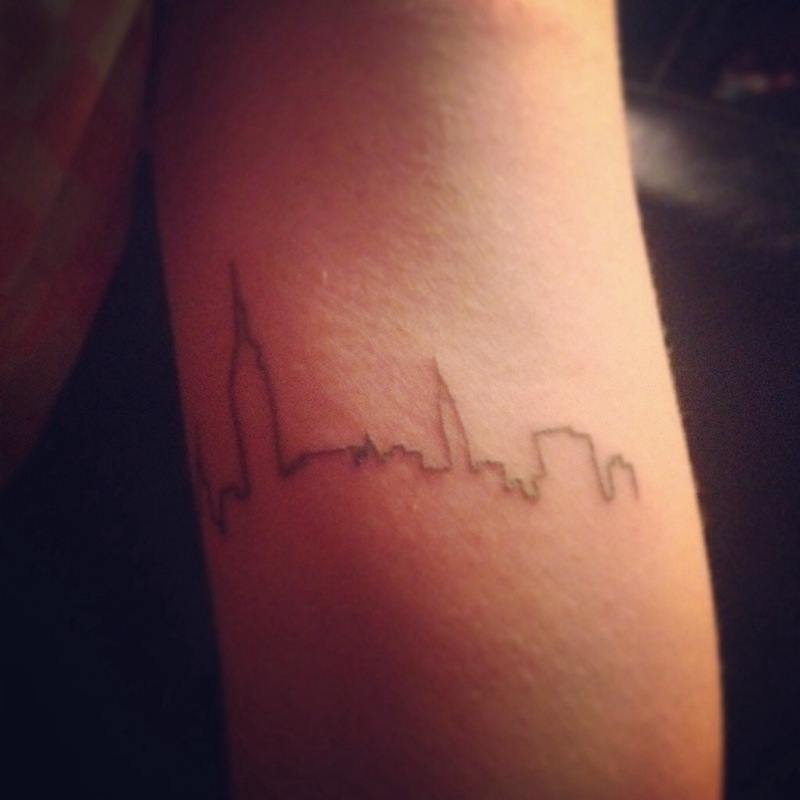 And then when I return to the city, I’m going to rest for one day before traveling to the Lower East Side for tattoo number six, one that will be very visible and very planned, and I absolutely can’t wait. It’s going to remind me of this time in my life, where I’m surrounded by love and the one-bedroom apartment that no longer feels so empty, and one day I think it will remind me that life is meant to enjoy. As my coworkers and I made it into the office this morning, we all stared at each other in some level of shock and unhappiness, having been forced to come into the office on a miserable, dreary, grey, rainy New York day. I shook half a cloud off of my umbrella and squeezed my hair behind my cube, trying my best to wring out what water had managed to infiltrate my umbrella, hat and rain jacket before getting started on my day. I’d actually remembered to check the weather in the morning, and seeing the entire day promised to be a total mess, I didn’t bother putting on makeup, wore my glasses and even did the unthinkable: I wore sneakers on my commute. I got a great look at myself in the mirror of the elevator as I made it up the many floors to my office, and had to laugh at the sight of such a person – I could pass for a tourist or a newcomer, the opposite of the put-together New Yorker I try to emulate in my usual daily routine. I’ve always loved the rain. There’s something beautiful about a city in the rain, the way the drops bounce off the buildings like a dance, a complete juxtaposition to the gloomy people underneath broken umbrellas below. I love a good pair of rainboots, dancing in a storm, shaking the weather out of my hair, inviting the lion’s mane of curls to wrap around my neck, my face, sticky with raindrops and dripping red dye. Any of the cities I’ve visited or lived in have such a distinct personality in the rain, the torrential downpours in Buenos Aires that come and go as quickly as you can take out your umbrella, the misty showers in Amsterdam, like walking in a cloud, or the languid steps in Paris in the rain, enamored with the romanticism of such weather in such a city. New Yorkers hate the rain; we hate walking behind the idiots with the big beach umbrellas, hate how quickly the street umbrellas break, just as a bus drives by, close enough to splash the city puddles all over your legs. But there’s a part of me that loves it too, loves the chance to see the city without the crowds of people distracted by the skyscrapers, the only person looking up amid a sea of downtrodden commuters. There’s something going around this week, a misfire in the stars or maybe just a random series of coincidences in which I’ve gotten so many texts and calls from people who had something go wrong, a lost earring, a scolding from a boss, a piece of news that’s been feared for months. I’ve felt it too, sleeping in despite this being the first week I can do yoga again after the tattoo, reaching for potato chips and candy instead of sticking to the healthy fruits I’ve lugged from home. I think it’s just a reaction to the weather and the time of year, like the forthcoming forced merriment of the rapidly-approaching holidays needs the precursor of a rainy week and self-disappointment. I’m very much looking forward to the rest of the week, less rain and more holiday fun, with my company party on Thursday and a trip to Nyack for some shopping and dinner with my lovely friend M and her N on Saturday. And in the meantime, I’m fine soaking in some of the bad parts of the week for a few hours. After all, it won’t be like this forever – a good lesson to remember in all parts of life, whether soaking in the enormity of a life moving on, or just soaking in a New York City rainstorm on the way home from work. I probably understand more than most that tattoos are not for everyone. I don’t try to convince people they should consider a tattoo if they’re the type to say things like “I change my mind too often for something permanent!” (you’re really bragging about that?) or “I’m too scared of the pain.” A tattoo is a lifelong responsibility, not in the sense that it needs to be cared for forever, but if you have visible ink, people are going to look at you a certain way, think of you a certain way, and judge you a certain way, even if they’re tiny, like mine. It’s not all negative: I’ve had plenty of compliments on mine from strangers in the street, doctors, coworkers and even family. But I’ve also seen a look when people catch a glimpse of my arm or my ankle, coupled with the hoop in my nose, and there’s a brief moment where I feel them stand a little straighter, just enough so I know they’re looking down on me. After all, why would such a normal-looking girl do something like that to herself? I’ll readily admit that my first two tattoos were perhaps a touch on the impulsive side. I’ve always been the kind of person to plan ahead, looking at things in a vast, unknown future, and then decide in a brief moment of spontaneous inspiration that the future is RIGHT NOW and NEEDS TO HAPPEN. When this is in regards to a new dress I’ve been eyeing or finally giving into my near-constant craving for Wendy’s spicy chicken sandwich, the only things that really suffer are my overstuffed closet, wallet and waistline. Tattoos, on the other hand, put this kind of impulsivity into a completely different spotlight. Looking over the consent form is a surreal experience, words like “PERMANENT” and “SCARS,” “NOT LIABLE” and “PERMANENT” scream at you from every paragraph, rightfully reminding you that once this is done, there’s no turning back. That first line is a wake-up call to the lasting consequences of change, a pinch of pain, the buzzing from the gun humming at the same frequency as the ringing in your ears, and then the dull ache of needle on skin as the masterpiece comes to life. Some people ask me if I’m sick of looking at them after so many years, if they’ve lost their meaning. I look at the cheerful heart on my ankle, blue and white stripes with an almost imperceptible sun in the middle, but I know it’s there. I smile as I’m hit with memories of wandering barefoot on my friend’s balcony in the heart of Buenos Aires, munching on bread with homemade chimichurri and endless mugs of sweet sangria, singing along to his guitar while the asado permeated the air with the heady smell of grilled meats, a reminder of another LB, another place, 19 years old, such a child. I catch a glimpse of the one on my back and remember the last time I had to adjust to single life, surrounded by wild choices and no responsibilities in my last year of college, using the ink as a reminder that to love and be loved requires only me, another LB, another place, 21 years old, still learning. They’re as much a part of me as my freckles or my scars, and I love them for reminding me of places, people, and times in my life where I felt strong and felt alive. I always knew I wanted another, and will probably get one more still before I’m done. I know the full responsibility of a tattoo now. I know the stares, and the questions, and the disappointment etched in my parents’ faces as they observe what new hell I’ve done to my body. I’ve spent a few years planning for the third one, waiting and wanting and needing something that made all of the scary parts worth it. Just in case I forget where I live. A little reminder on my inner arm now serves forever as a good memory of a day where I woke up, sunshine seeping through my windows, highlighting all of the changes I’ve made in the apartment, in my life, since last fall. I remember sipping coffee and watching the clock, anxious for it to be the time to leave, hoping it wouldn’t take too long, just wanting to see the final product, willing it to life. I remember joking around with the artists in the shop, feeling so comfortable, ten minutes, no pain, and there it was forever. I spent the rest of the day in a delirious happiness with the decision, showing it off to everyone who didn’t ask, and then waking up only to remember it wasn’t a dream, and it was forever there, forever my piece of this time. Another LB, another place, 25 years old, finally growing up.